This audio description has been compiled by Trish Wheatley in January 2018. It was commissioned by Disability Arts Online on behalf of NDACA (the National Disability Arts Collection and Archive). It is approximately 7 minutes and 10 seconds long. Cherub is a small sculpture made from plaster. It features pinky-orange hues across a smooth surface like weathered stone with typical imperfections in the plaster such as the odd scratch or air bubble. Cherub is a head and top half of a torso with wings stretched out to the sides with minimal detail. The wingspan approximately 20 centimeters from tip to tip. The face is closer to the grotesque faces of the gargoyles seen in Medieval Corbel Sculpture than the cherub popularised by architects like Sir Christopher Wren in the 17th century. Cherub has large features, high cheekbones, full lips and a flat nose. The eyes are hollow without the pupils or iris marked in. Designed to sit above a doorframe, the cherub looks down at the viewer. Growing out of the bald skull are two small blunt horns pointing straight up. The expression on the face of the cherub is not menacing, but has a slightly mocking smile. The wings are formed very simply without detailed feathers but rather a smooth indication of a wing shape with a strong definition at the front that sweeps down into the collarbone and chest. The torso ends above the waist. Adam Reynolds achieved prominence in the art world as a sculptor, curator, gallery owner, arts adviser and campaigner. He is thought to have made the sculpture Cherub in 1986, aged 27 – two years after he opened his pioneering artist-led exhibition space Adam Gallery. Adam Gallery hosted artists like Tracy Emin and Jeremy Deller, long before they became known. It was “A wedge-shaped, labyrinthine ex-cobbler’s shop in Walcot Square, South London, which served as a home, studio and gallery” and is likely to be where Cherub was made. Reynolds was born in London in 1959 and grew up in Buckinghamshire. He read medieval history and European literature at Sussex University. His formal arts training came with the study of sculpture at the Sir John Cass School of Art. Reynolds’ approach to sculpture was eclectic, using whichever medium he thought best suited the concept or design. Anecdotally, it is known that Reynolds made other works in plaster, but Cherub appears to be a one off. There is no knowledge of any other editions having been produced. Cherub seems to fit with a series Reynolds made with other gargoyle-type creatures and is typical of his works that explore the different perspectives his physicality brought him. The Shape Arts collection holds an example cast in lead. Cherubs are symbolic of love and purity and were originally adopted into Christian iconography from Greek myth. Reynolds has ‘demonised’ his cherub conveying a message, which could be read as a comment on the dichotomy of being a disabled person – put on a pedestal as an idolised object of sexless innocence – yet vilified on the other hand as a burden to society, unworthy of existence. The fact that Cherub is designed to sit above a doorframe is directly linked to Reynolds’ lived experience in that it mirrors his own perspective on the world to a wider audience, as a wheelchair-user. Reynolds played with the concept of the non-disabled gaze in his work by placing pieces in irregular spaces where people don’t usually look. 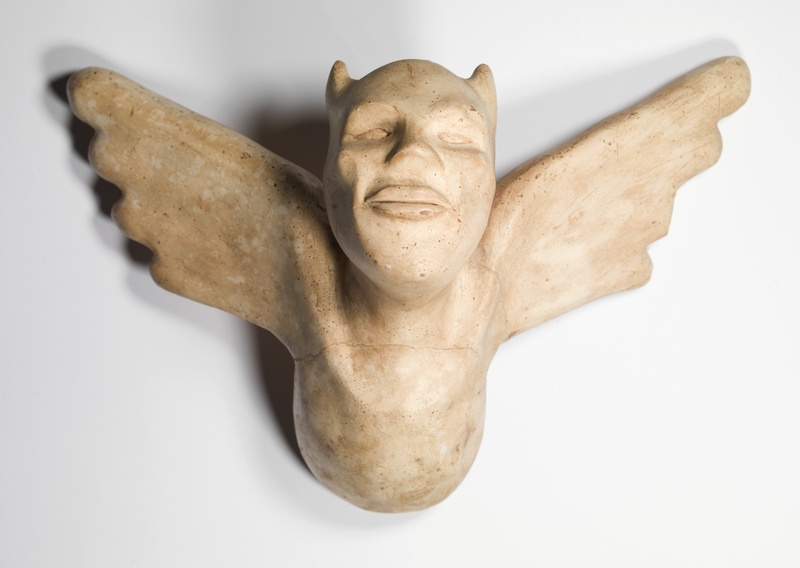 Reynolds donated Cherub to the National Disability Arts Collection and Archive during its initial phase based at Holton Lee in Dorset. Here, the beginnings of a collection were being formed in order to raise funds and support for the initiative. It was displayed in the Farmhouse above the doorway to the dining room, between the kitchen and the office so that staff and visitors would stop to notice and consider that space and the artwork rather than simply passing through. Three years before his untimely death in 2005, Reynolds donated two other items as part of the DA21 conference and exhibition: The Pillar of Damocles and Temptation. Reynolds visited Holton Lee frequently, staying in the holiday cottages. He was commissioned to make one of the Waymarkers, called ‘Shelter’. This temporary piece, no longer in existence, provided a sanctuary from the elements in the forested area of the 350-acre site. This audio description was compiled using the following sources: The book Strength: Broadsides from Disability on the Arts by Paddy Masefield, DA21 Disability Arts In the 21st Century conference catalogue, The Holton Lee archive catalogue, Obituaries from the Guardian, the Independent, the Telegraph and the Northern Echo and anecdotes from former Holton Lee employees.